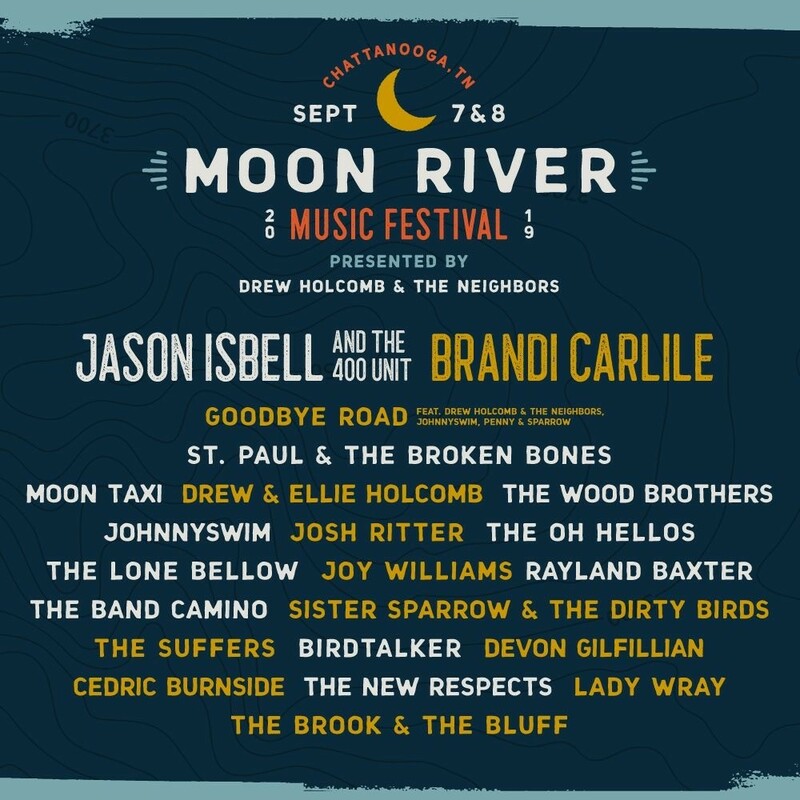 Moon River Music Festival will once again find itself on the banks of the Tennessee River at Coolidge Park in Chattanooga from Sept 7-8 this year. Co-founded in 2014 by musician Drew Holcomb and Paul Steele, the manager of Drew Holcomb and the Neighbors, the festival favors neo-folk and Americana artists, providing a sizable platform for artists from across the country to offer their various musical wares. Holcomb will host a "Songwriters In-The-Round" event alongside Heather Morgan and Marcus Hummon on Sept. 6 at the Walker Theatre in Chattanooga. Tickets to this event will be made available exclusively to those attending Moon River as a bonus. As well as the general passes/tickets, a small number of VIP tickets will also be able to be purchased. These will will include expedited entrance to the grounds, an air-conditioned viewing area and restroom, an exclusive gift package and entry into the aforementioned "Songwriters-In-The-Round" concert. Today, the festival announced the lineup for 2019, and it’s filled with Grammy winners, at-country rebels and folk innovators. Find the full lineup below and on their website. Tickets will officially go on sale Feb. 13, although previous festival attendees will have the opportunity to purchase advance tickets on Feb. 12 from 10 a.m. until midnight. You can purchase your tickets here. Moon River will also be bringing back some much-loved non-musical experiences, including The Lookout Lodge, an on-grounds sports bar for those who want to take a break from the music and watch NFL or college football games and the REI Outdoor Experience, which includes kayaking, rock climbing beneath the nearby Walnut Street Bridge and paddleboarding on the Tennessee River. They’ll also be setting up the Tennessee Tavern again, a specially created cocktail and craft beer center which they host in partnership with various local Tennessee breweries.